Sounds awesome. Music on Vinyl did a good job with this one. Unfortunately, this version did NOT include a download card, which a majority of MOV releases DO include. Disappointing. Pressing is of good quality, though, and that's way more important. This is one of their best especially with the extra track that was pulled early on called it's all happening now! Note: this was only sent to about 100 fanclub members before the item was pulled back to remove the extra track with the Dylan sample. I was one of those members and was also told the amount that were sent prior to the recall. needs a quality repress. having the creation pressing would be terrifiic but current listing is $230.00...just too much. and in my opinion, their 3rd and 4th albums were their height of songwriting and composition. 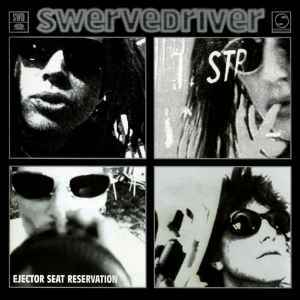 I have this vinyl autographed by the entire Swervedriver Ejector Seat Lineup. I am also curious as to how many of these were pressed. Gorgeous album. Any idea how many were pressed? . . . . This is a great record, that may take a little getting used to. As I listened, the sound was to me, at first, bizarre; I consulted another digital version quickly to confirm that my player was going at the right speed. This is a bass-heavy record, even a bit murky. There are a couple sounds on here that you can only describe as 'interesting', and some of these come very early on. Adam Franklin's songs are a ramble of poetry, the accents fluid and shifting, over a wash of crunchy chords and guitar lines; then there's a slightly more structured-sounding line; he sings it again; then it's back into the steady, hypnotic flow of words. "Was that the chorus?" you wonder. I don't know if it was technically the chorus, but you'll still be humming it to yourself days from now; you'll be singing it again and again, even if it was only 15 seconds of music and two lines of lyrics, so you'll sound a bit mad. There's nothing like an exception to prove a rule, and what these songs will make you realize is that normal pop songs have hooks that you can grab onto; words like 'catchy' and 'hook' ascribe an agency to the music that often belongs more to the listener; but these songs have hooks that grab you. They just get under your skin and burrow into some deep part of your mind and settle there. They do the good work of any great pop song, but they do it a little bit differently. The fact is, this whole album is hard to latch onto. There's a lot of interesting harmonies in the interplay between the instruments, but they often blend together into a larger, muddy texture. Song structures are just clear enough that you can tell your expectations are constantly being subverted in small ways: the verse in "Son Of Jaguar 'E'" starts up again after the chorus in the middle of the chord structure, "The Other Jesus" has a regular lyric structure over a strangely shifting instrumental arrangement (and throws in a weird half line break before the final line), "Bubbling Up" has a changing accent pattern seeming dictated by number of syllables that are squeezed into each line, and the title track has a rambling flow of words that almost seem more west coast rap than shoegaze rock. Once you're on the band's wavelength, though, you'll find that the hypnotic quality of the songs puts you in the perfect dreamy state so that the hooks get in under your radar and hit you all the harder. Really, that's what the album seems like, sometimes: a lot of beautiful, dreamy, prophetic filler that serves to set up the catchy but fleeting chorus so that each one comes as an epiphany, and by the end of the album they're all stuck in your head at the same time. Each song is fundamentally different, and it's just so hard to choose favourites because they're all subtly well-crafted. In the end, it's all you can ask for in an album: a unique sound and point of view that produce great songs with a lot of great moments, and let them all work together without sounding the same. This gets five stars not for being perfect, but for being thoroughly convincing. Some standout moments: "I Am Superman" has an amazing, chaotic backing, probably some of the best instrumental arranging on the album; "Bring Me The Head Of The Fortune Teller" isn't quite quoting The Beatles' "Things We Said Today", but it's more than borrowing from it, and the effect is like that of getting a great song stuck in your head, not quite knowing which one it is, and having it drive you crazy. The 7" included is a treasure in itself, and definitely feels like its own release. "Flaming Heart" is as catchy as anything on the album, but possibly just too straightforward a song to fit. The B side is just a really pleasing loop that fades in, plays for the length of the side, and then fades out. It's beautifully constructed and you can easily listen to it for the full length trying to figure out how it's put together. The obverse of the cover is perfectly reasonable for a rock group with four members; the reverse is sort of an ugly and jarring shade of blue, but it's concise, and the bird being there at least makes sense. Definitely the standout is the inner sleeve, with the obverse having a fun collage of band photos, and the reverse serving as lyric sheet and credits. Many of the songs have the lyrics printed in a single flow with line breaks not matching the structure, but with each line capitalized; this is obviously a great choice, and the titles are all printed creatively to fit around the lyrics. The title track is, against all odds, actually printed with each line of lyrics on its own line of text, but the lines are squished into each other vertically to fit. Everything about it just seems to 'get' the feeling of the songs and the album as a whole. Bonus 7" includes insert with picture and description of Policeman's Helmet (flower).